Oatmeal Raisin & Oatmeal Chocolate Chip Cookie Ice Cream Sandwiches with Vanilla-Cinnamon Ice Cream. My dad's favorite cookie is Oatmeal Raisin. He doesn't want Oatmeal Chocolate Chip cookies or Oatmeal Cranberry cookies or Oatmeal Toffee cookies or Oatmeal Chocolate Cranberry Toffee cookies. You may have guessed that I have tried. I can't help myself...I like to mix it up a little. So, when he came to visit a few weeks ago, I made Oatmeal Raisin cookies. I also made a few Oatmeal Chocolate Chip cookies and set a few of each kind of cookie aside to make ice cream sandwiches. First, I needed ice cream. I thought Vanilla Cinnamon would go really well with the Oatmeal Cookies. This recipe is a modified version of French Vanilla from the Ben & Jerry's Ice Cream & Dessert Book. Whisk the eggs in a large bowl for 1-2 minutes, until light and fluffy. Gradually whisk in the sugar. Whisk 1 minute more after adding all of the sugar. Add the cream, milk, vanilla and cinnamon; whisk until blended. 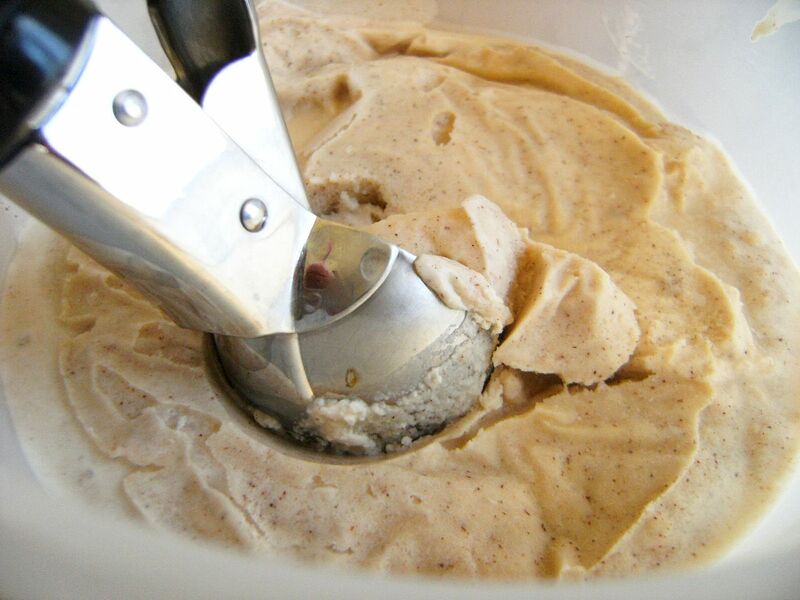 Transfer mixture to an ice cream maker and follow the manufacturer's instructions. The ice cream will be quite soft after mixing. Scoop into a freezer-safe container and freeze several hours until firm. The cookie recipe is from The King Arthur Flour's Cookie Companion (this book is a goldmine of cookie recipes!). I made the full recipe, omitting the nuts...then halved the dough, added raisins to one half and chocolate chips to the other. In a food processor, pulse the oats to make them smaller and thinner, but don't grind them to bits. :) Set aside. Cream together the butter, shortening, sugars, extracts, spices, salt & baking soda until smooth. Beat in the egg, scraping down the bowl as needed. Beat in the corn syrup and milk. Stir in the oats and flour. Remove half the dough to another bowl. Stir in raisins to one bowl of dough and chocolate chip to the other. 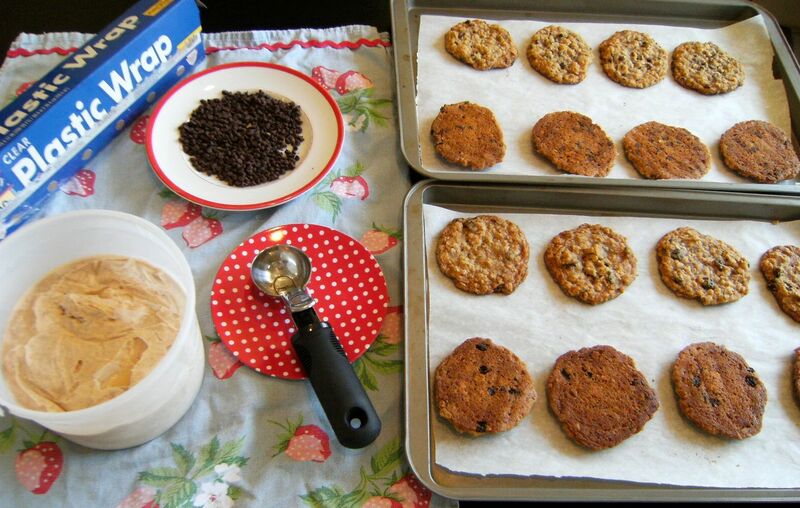 Drop the dough by the rounded tablespoon onto the prepared sheets. Bake for 11 minutes, until they are a light golden brown. Let sit on the baking sheet for 1 minute, then transfer to a cooling rack to cool completely. 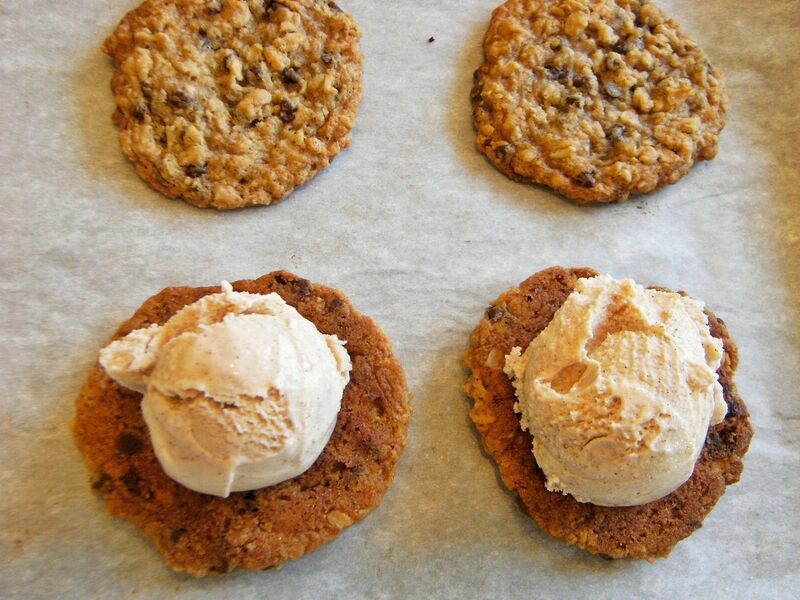 Scoop out the hardened ice cream on the flat side of one cookie, top with another and press. 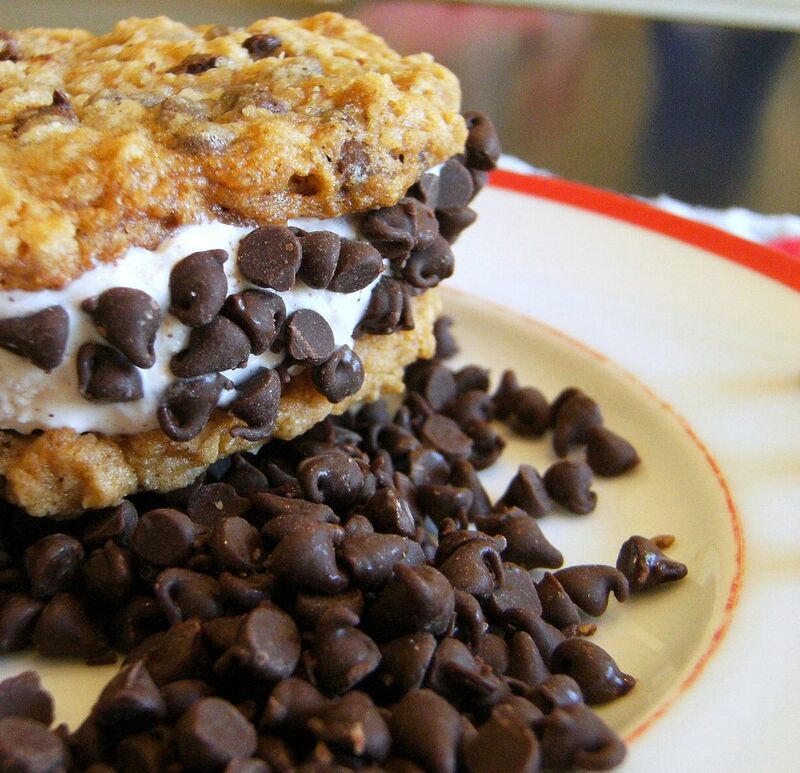 If desired, and you know it is around here, roll the sides of the oatmeal chocolate chip ice cream sandwiches in mini chocolate chips. What is your dad's favorite dessert? My Dad LOVES pecan pie! I do, too. Gosh these look so good. It's hard to make ice cream sandwiches because the cookies get gobbled up SO fast! Next time, I will set some aside for it, great tip! My dad's favorite is pecan pie. These look amazing! I want to try them. Thanks for sharing. Love & blessings from NC! Oh. My. Goodness. Only good things will come to a person who shares this amazing recipe with the world! These look amazing. I LOVE oatmeal chocolate chip cookies. Have never been a raisin fan. And the homemade cinnamon vanilla ice cream?? I'm ready to try this. Thank you! My father's favorite dessert was chocolate chip cookies. I could weasel out of any household chore if I said i was just about to make cookies! He would have loved these! My Dad loves brownies (with or without walnuts). That is his favorite dessert and he requests that every birthday and father's day. they looks so good, I love ice cream sandwiches! My dads favorite might just be the 4 layer praline cake I made for him years ago. Those look delicious! My Dad's favorite cookie is also oatmeal raisin; however, his favorite cake is pineapple upside down cake, and has a new love of pineapple meringue pie since I made it for Thanksgiving. Is it wrong to be drooling over these at 7 a.m.? If it is, I don't care. GREAT flavor combo, Bridget! I don't think my dad has a favourite dessert. He loves fruit salad with a lump of vanilla ice cream, and he also loves muffins of any kind, but he'll eat and enjoy almost anything that's put in front of him. I've no idea how he's so skinny, it's very unfair. That is funny that he didn't eat the sandwich! My husband will love these. Not really for sure on what my dad's favorite dessert was. However, he loved to bake people pies and cakes for special occasions. His favorite to bake people was a pound cake and no one could ever make them like he did. My favorite he ever baked was a coconut cake. Everything was always baked homemade, he never took any short cuts. I sure do miss my dad. So thankful he taught me out too cook and bake. He was one awesome dad and man. Just not the same without him here with us. Thanks for bringing back such wonderful memories. your cookies look delicious even tho oatmeal/raisin aren't my favorite, i can understand why your dad just ate the cookies. Ooooh, I wonder if theses are acceptable to eat for breakfast. They're making my mouth water and it's only 9:00! My dad's favorite dessert is my mom's pumpkin pie (no one elses) and creme brulee! Oh these look fabulous! 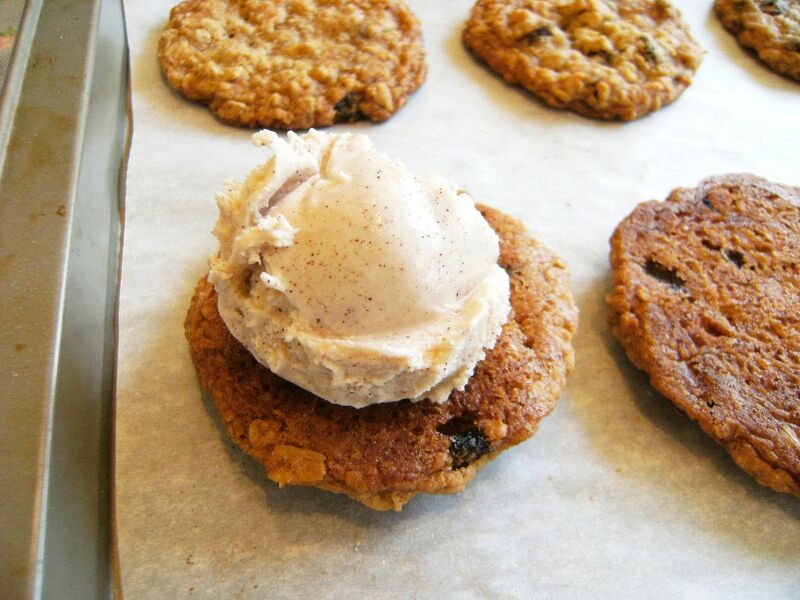 The cinnamon ice cream sounds delicious, and I am a huge sucker for oatmeal raisin cookies. Funny you should ask about dad's favorite dessert because today is my dad's birthday! He passed away 11 years ago, so I was just thinking of him when I saw your Tweet about this post. His favorite dessert was German Chocolate Cake. I am thinking of tackling it for Father's Day this year! 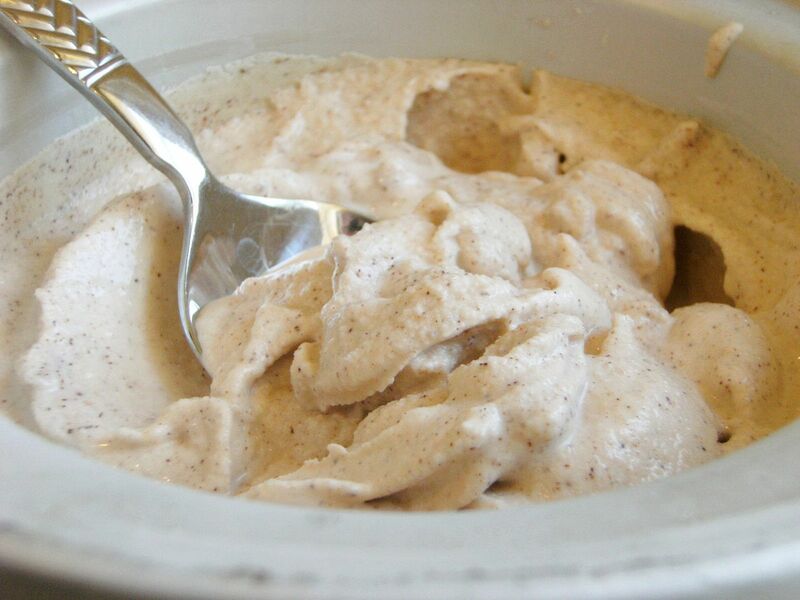 I think cinnamon ice cream sounds delicious. I must admit that I don't particularly like oatmeal cookies, but this combination sounds really good! I couldn't be sure what my dad's favorite dessert is - he likes so many! He often requests hot chocolate pudding on ice cream (really, REALLY good). YUM! those look so good, and the vanilla cinnamon ice cream sounds amazing! These look simply amazing. I'll have to try these with the cinnamon spice ice cream I make! Yum! Amazing looking! That ice cream..those cookies..wow! OMG! You make your own ice-cream too! The sandwiches look delicious and I love the fact that you rolled them in chocolate chips. 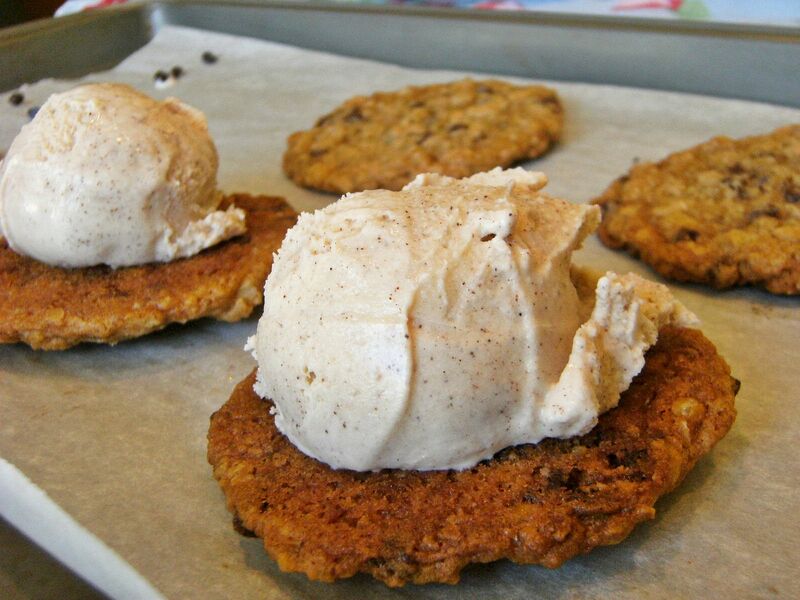 I love a chewy cookie so this recipe, both the cookie and ice cream will go in my favs folder. I will have to try and make these for when the grand-girls visit. Thanks for posting. My dad loves crunchy cookies too - I'll have to make these for him. Thanks for sharing the recipe and great photos. I'll have the ice cream that your dad didn't have! Oatmeal raisin are one of my favs. I want to try the oatmeal cranberry cookies with white chocolate chunks on the bag of Craisins in my pantry. Have you tried something simillar? So funny,I was reading your post wondering if your dad would eat them. 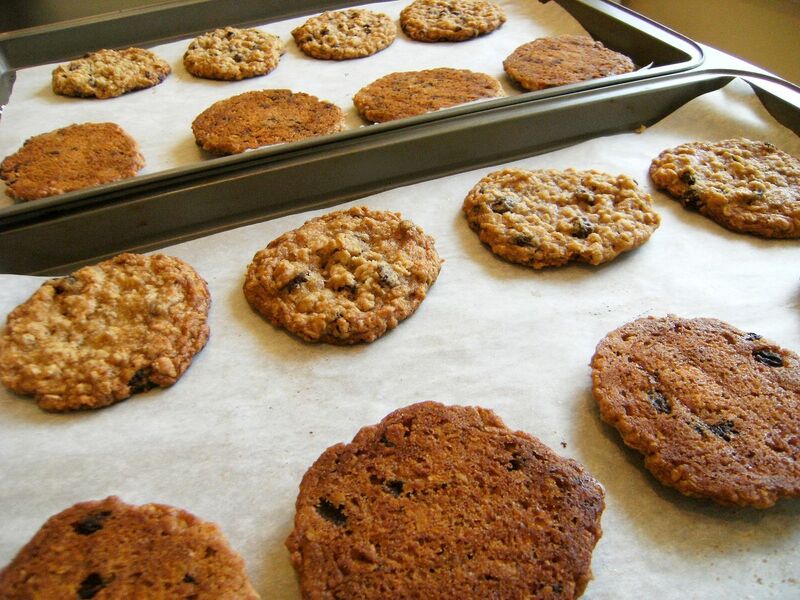 My dad's favorite is oatmeal raisin too, so I'm always searching for the best recipe. Last time around, I soaked the raisins in dark rum first.They were so good! Can't wait to try the cinnamon ice cream. Sounds amazing. And don't feel bad about the ironing, my son told his grandpa recently he had no idea what an iron was (and he's almost 9)! Oh, those look soooooo good. My dad is not really a dessert person, but I remember my grandpa and I had a special connection because we both loved dark chocolate. I would make Papa a cake with fudge frosting every time they visited. PS--I LOVE your blog...you're awesome! mmmm these look so nice. They will be great on a hot summers day....I can just imagine eating one now!! Oh Bridget these look AMAZING!!! I am SOOO making that icecream! if nothing else! My dad was a HUGE dessert lover...he'd eat anything, and I loved to bake, so he'd eat anything I'd make..........I really stopped baking a lot after he died, it's just been in the last few years that I've been in the mood to start baking again!! Thanks for sharing this!! I can't wait to try it!! Haha, my dad will eat ANY kind of dessert! I don't think there is a favorite. But he does love Pecan Pie. My dad and your dad are kindred spirits. He likes his oatmeal cookies just the way they are, thankyouverymuch. But he probably would have had the ice cream later, by itself. My dad loves rugelach. The Barefoot Contessa has a fantastic recipe on www.foodnetwork.com. Easy to make and sooooo delicious. I just fell off this chair! to see what was the matter...all he could see was a big puffy PINK robe on the floor! I just hate it when I fall off my chair out of utter amazement at such scrumptiousness!!!! I can't tell you how IMPRESSED I am that you whipped up your own homemade ice cream for your sweet Daddy! Is in the BOOK!!!! Got it!!!!! well it's a GINGER SNAP! And my sweet Mama heats them up before she SERVES him the cookies! I just wanted to say thank you for the time and effort you put into your blog. I love your creations. I was recently provided a "Sunshine Award" which I wanted to pass along to you as a thank you for all the beauty you bring to all of your readers. It isn't much, but it is a small symbol of my appreciation. Your recipes always look so delicious, and I am amazed at your artistry with the cookies. You have inspired me to try my hand as well, though I am far from ever reaching your expertise. Thank you for sharing and inspiring. I'm pretty sure my Dad likes Banana cake with vanilla buttercream. But, he's flexible and will eat any baked good that I make. It's my husband that is the problem, he only likes chocolate cake with chocolate buttercream and chocolate chip cookies. And much like you, I try to mix things up and he never goes for it. The ice cream sandwiches look amazing. Wow, these look so good!!! I really want one. THanks for sharing this absolutely delicious recipe daaaaahling! Thank you for this recipe! Sounds like a book I need to get. We just tried your recipe and it is divine!! I used some kind of pasteurized egg product (my grocery store is kinda ghetto), a whole cup of sugar, 1T of cinnamon and 1/2 T of pumpkin pie spice... SOOOO GOOOOOD!!!! Turned out perfect.